2018 has been quite a year. I didn’t realize I’d hit so many milestones all at once, but I suppose that’s fitting because it’s my 10th year in business, which in itself is a milestone. This year was my best year in some respects, but it was also a hard year at times. Some things fell through that I previously counted on, other opportunities found their way to me that were totally unexpected. It all worked out in the end! This major milestone snuck up on me. I remember when I first opened my Etsy shop in 2009 (and started Once Again Sam simultaneously), I obsessed over every sale until I made it to 100 sales, which took about a full year. After that, I stopped worrying about the number and focused more on where I wanted to go with this handmade business. It’s been an incredible journey on Etsy and I hope to see 20,000 sales one day! That’s 100 set ups, 100 teardowns, 200 precise packings / re-packings of the car, thousands of miles on the road, good hotels, bad hotels, perfect weather, horrible weather, early mornings, late nights, and who knows how many hours talking to customers & other vendors. It’s a hard life. I admire people who do festivals full time, but I’ve learned over the last few years that I don’t want to be in a different city every weekend. I have drastically cut back on the number of events I do now, but all of those experiences at various craft shows and art festivals have taught me so much about my product, my customers, and myself. I had a sales goal for the year, and I made it, but just barely. Every month I checked that we were on track to make that goal, and most of the time we were, but not always. I love a good “stretch goal” - something that pushes you to keep going, keep trying, keep making. 2018 was the first year I did multiple wholesale trade shows, and it paid off. With Etsy Wholesale closing up mid year, I had to hustle to make up for that loss, and when I look back at the number of wholesale orders from the year that came in solely from tradeshows and contacts made there, it’s easy to see this is a worthwhile investment for my business. I took on my biggest commission (both in quantity and in size) this year for a local company called Kentwool. 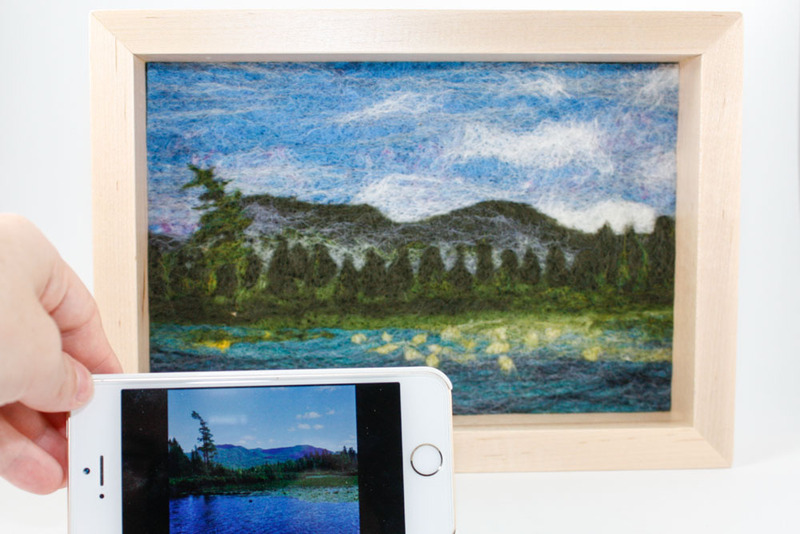 I created 75 custom landscapes for them in the spring, then in the fall, I took on my first extra large needle felted landscape commission which was 24” x 36”. That was double the size of my largest piece previously! I never would have attempted something that big on my own, but now I feel empowered to work at whatever scale I want. In May of 2018, I had the honor of being Artist in Residence at Poinsett State Park, and during my time there I created 40 pieces inspired by my surroundings which were then exhibited at Art & Light Gallery. Never before have I created such a large series around a specific location, and I really enjoyed the challenge. I enjoyed it so much I’m doing another residency next year and have an even bigger exhibition opportunity lined up for the summer. That’s all I can share till next year! It doesn’t feel like a long time to me, but I have come to realize a lot of Makers and small businesses simply don’t last that long. I’m one of the lucky ones! I think one big factor in why I have lasted this long and made every year better than the last is because I do a variety of things. When I’m sick of needle felting, I bounce back to jewelry. I’m not stuck in a single medium. I also never gave up my day job, and continue to work a few days a week as an Interior Designer, which gets me out of the studio and uses a totally different part of my brain. I’ll admit I don’t have much free time anymore, but I’m doing things I want to do with my time, and that matters far more to me. Commissioning a piece of original art may be intimidating if you've never done it before. There’s so many unknowns. Will it look like what you envisioned? How much will it cost? How long does it take? Is the artist you have in mind currently taking on custom requests? I wouldn’t want any of my customers to feel this way or to rule out custom orders because they’re unsure about the process. Commissioning art can be an enjoyable experience so I thought I’d share how I personally handle commissions and answer some FAQ. A huge part of my handmade business is custom work, so I welcome special requests! Q: I’m interested in commissioning a wool landscape painting. What do I need to do? A: Send me a message via Facebook, Instagram, Etsy, or contact form to get the conversation started. If you have a photo you’d like me to use as a reference for the piece, please include that. We'll work out the size, frame choice, deadline, and go from there. 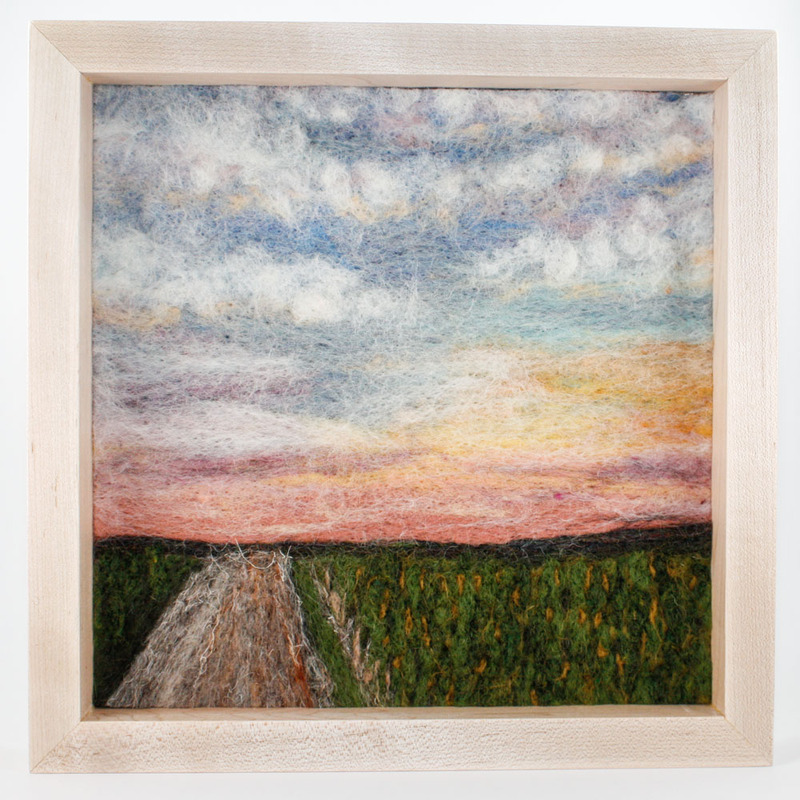 Pricing depends on size and complexity of the piece, but a good ballpark budget number for custom felted landscapes is $2 per square inch. For example, an 8x10 scene would typically run $160, which includes the frame. Q: I saw something in your Etsy shop or Instagram that I liked, but I want it in another color (or a slightly different design, size, etc.). A: No problem! Nearly all of my jewelry can be customized, and often times the fiber art can be recreated or tweaked to be a specific size, alternate color range, etc. Q: Do I pay before or after the work is done? A: 99% of the time I’ll request payment upfront. This goes for jewelry, fiber art, or any other custom orders. Once I’ve received payment, your order will be added to my list and I complete them in order of payment received (unless there’s a specific deadline previously discussed). Q: Does a custom order cost more? A: Not necessarily! The price is usually the same, but it may take a few days longer to create, depending on the request and if I need to special order materials. Q: Do you offer proofs or photos prior to shipping a custom order? A: I typically don’t do this for custom jewelry, ornaments, or smaller items. However, for the custom wool landscapes, I’m happy to to show you progress pictures upon request. Q: Do you offer discounts on bulk orders? A: When it comes to jewelry, yes, I'm happy to work with you on the total price if you're ordering 10 or more pieces. When it comes to the fiber art, the price is firm. Needle felting is a very tedious process and this is the reason my fiber art work never goes on sale online or at events. Q: The piece I wanted to buy has already sold. Can you make another? A: Probably so! I don't mind recreating pieces (although they'll always be slightly different than the original because they're handmade). If you see something that's sold, get in touch and I'll let you know if I can recreate something similar. DON’T commission artists to knock off other artist’s work. It’s not cool, and it’s no fair. DO ask artists for references or examples of past work if you’re unsure if they’re the right person for the job. DON’T expect the artist to deliver the finished piece in person, even if they’re local. DO ask for progress images if you’re particular about the composition, materials, etc. DON’T be afraid to be specific if you have a certain size, look, or deadline in mind. Share that with the artist from the start so they can accommodate your wishes. DO allow the artist to do what they do best and embrace their process. The finished piece will surely look different than what you had in your mind, but hopefully it’ll be even better than what you imagined. This month, I’m honored to share my personal story and creative workspace in the summer issue of Where Women Create. This magazine showcases artists, crafters, and makers in a way that allows you a personal look at their space, but also shares their creative journey. I really enjoyed reflecting on how I got to this point in my life and all the things that added up to make it what it is today. I feel like I’m just getting started - there’s so much more I want to do! Checkout the full story below see additional photos that weren’t used in the article. All photos courtesy of the talented Eli Warren. I was born to create. My love of art and working with my hands started early in life, so early I don’t remember when exactly. I can recall peeling my sleeping mother’s eyes open before sunrise and begging her to come downstairs and draw with me when I was about four years old, and she, in all her love and patience, would do just that. I think that’s where my story begins, with creative and supportive parents. Growing up, I couldn’t get enough art in my life, so my parents took me to museums often and signed me up for additional art classes after school, encouraging me to pursue it. My mom was a self-taught artist, and although she did it purely for her own enjoyment and to decorate our home, there was never any question that I could do it as a serious career if I wanted to, and I’m so grateful for that freedom. As long as there was art & design in my future in some shape or form, I knew I’d be happy. After 4 years of intense design study & a wide range of fine art studio courses, I received my BFA from Maryland Institute College of Art in 2005. Shortly after graduating I got married, lost my mom to cancer, and began working as an interior designer for a commercial architecture firm. My whole world changed in just two short months, and for the first time in my life, I wasn’t creating with my hands. I never realized how important that part of me was until it went missing. Knowing me all too well, my husband Josh encouraged me to open an Etsy shop and get back to making. That little decision changed everything. Not only did I get back to my roots as an artist and rediscover the joy of creating, I was now on a double career path as an interior designer and an entrepreneur, and these creative pursuits complimented each other in unexpected ways. Working as as an interior designer, I had access to all kinds of outdated material samples like leather upholstery swatches and wood veneer. I took those miscellaneous odds and ends that were bound for the trash and gave them new life, once again, in a whole new way. My business name, “Once Again Sam”, hinted at my love of reusing materials, and although “SAM” wasn’t me exactly (those are my initials but nobody calls me that), it was someone I wanted to become. I wanted to start a new creative life, and not have to choose to do just one thing or have a single career. The freedom to pursue art, the encouragement I had growing up as well as from my husband, inspired me to go for it. ALL of it. I chose not to choose a single path. I’m currently an interior designer, a fiber artist, jewelry designer & maker, entrepreneur, and published author. That list will probably grow with time. It’s not that I don’t know what I want to do when I grow up, it’s that I want to do so many things. My greatest joy is creating and imagining, and it doesn’t matter if it’s a beautiful space for a client, an intricate design for a leather cuff bracelet, a life-like plant made out of wool fiber, or a fictional story about a soap-eating giraffe. I live to create. Any medium will do. The majority of my time is spent working from my home studio running Once Again Sam, which has grown into a thriving small business that takes me to the post office 5 days a week and all over the southeast for craft show events. My husband Josh, who is responsible for putting the crazy idea into my head that I could actually start a small company, is my my business partner. A good portion of our home is dedicated for Once Again Sam workspace. The dining room isn’t used to entertain anymore, it stores inventory and displays for craft shows. My husband and I share an office, where we do accounting, photo editing, etc. Upstairs is my studio, where I do final assembly, product photography, store materials, and ship orders. The basement is our workshop wonderland. Josh and I both enjoy working with wood, so we’ve got all our loud messy tools and machines down there, including my favorite tool, the 90 watt laser cutter. Just as my days are a combination of many things, the same can be said of my handmade jewelry collection. My work marries basic hand tools with high tech equipment, and common materials are often mixed with the exotic. I still use a lot of recycled leather material in my jewelry designs, just like I did when I first opened my Etsy shop in 2009. Sometimes I do the cutouts by hand, other times I leave it to the laser cutter. I enjoy learning new skills and have a long list of things to try. My husband and I took a wood turning class together a few years ago and have enjoyed getting into wood turning. I’m finally getting the hang of sculpting modern pendants on the lathe. I’ve also taken up painting recently, and my series of landscape pendants feature a panoramic painting that’s cut up into sections so the owner may wear an original piece of art any day of the week. A huge portion of my business revolves around custom jewelry. Customers can order a pendant featuring a portrait of their child, favorite animal, or home state, etched into painted wood. With a wide range of handmade options, there’s truly something for everyone at Once Again Sam. My creative journey is just getting started. I never could have guessed I’d be where I am now, and can’t wait to see where my creative careers take me in the future. Starting something can be the hardest part. 2016 was quite the year for Once Again Sam. After taking a much-needed break during the holidays, I had some time to look back over the last 12 months and reflect on all my little handmade business has been through this past year. I felt like I barely crossed the 2016 finish line – I’ve never been so busy before, but it was a phenomenal end to a phenomenal year, and I’m celebrating big time. I’m so grateful for everything about 2016, and feel overwhelmingly blessed by each and every thing that made up this chapter. Many of my business goals were met this year – I became an LLC, printed my first catalog, participated in my first tradeshow, graduated from Etsy’s “SAM Program”, grew the wholesale side of my business, invested in advertising, and nearly doubled my Etsy sales. I have LOTS of goals for 2017, but I’ll wait to share those after The Maker’s Summit in March, because no doubt I’ll have twice as many goals after the 2-day conference. The significant spike in business this year certainly had to do with a lot of hard work and a little luck, but there were several specific changes I made in 2016 that might be something for you to consider as you grow (or start) your handmade business. I have learned so much from other Makers over the years, and am happy to share what I know in return. That’s the beauty of the handmade community! 1. Promoted listings on Etsy & Google: I was skeptical to try this, but looking at what I spent vs. what those promoted listings earned, it was well worth my daily $5 budget. It takes almost no effort once you set it up, and the payoff can be big. 2. Launched 5 new collections: it seems like it should be pretty easy since I love to experiment and create, but getting my act together to launch 5 cohesive collections is a lot more involved than you might think. The previous year, I hardly launched anything new, only 2 small collections, so having 5 completely new series to share within a 12 month time period is something I’m very proud of and hope to continue in the next year. Several new collections came about during the 30 day #CreativeSprint challenge (April & October). If you want to grow, you have to keep coming up with new ideas – those tried & true best sellers are fine, and by all means keep making them if they’re selling well, but always be working on what's next. 3. Graduated from the “SAM” Program on Etsy. The “Seller Account Management" Program was something I applied for back in 2015, and my year of one-on-one coaching started last December. I was teamed up with an awesome Etsy staffer who coached me, answered questions specific to my shop, and helped me set goals for the future. I highly recommend applying for this program, even if you’re an Etsy veteran like me. I’ve been selling on Etsy since 2009, been very pleased with my sales for the last 4 or 5 years, but there’s always room to grow. In my case, there was a TON of room to grow, way more than I thought, and I earned nearly twice as much on Etsy this year compared to last year, all thanks to things I learned in the SAM program. 4. Grew my wholesale business: I started out 2016 with a brand new product catalog, a booth at my first tradeshow, and high hopes of developing new retail relationships. The focused effort worked! Wholesale is something I know I can grow even further in the future, so I’m investing in tools & making a game plan for how to improve my wholesale outreach going forward. 5. Tried 5 new events (craft shows, art fairs, pop up shops): some of that came out of necessity because two of my biggest sales days from 2015 didn’t happen in 2016, and I felt I had to make up for them or my financial projections for the year were shot. Just to give it some context, these two sales days from 2015 accounted for over 20% of my income that year, so it could have been a big big problem for 2016, but everything turned out incredibly well, despite all my needless worrying. One event (Artisphere) did not accept my work in 2016, and the other (Indie Craft Parade) moved to a different model for their holiday event, which significantly changed things for me. This was out of my control, and I learned the hard way you can’t always plan your season around shows you love or have done in the past, because they can change or go away, and it's not up to you. However, I did learn another valuable lesson here – I applied for several new shows, ones I didn’t know much about, or that weren't as well known as others, and they turned out to be really great events that I will definitely plan on doing in the future. You never know how you’ll do at any given event until you try it for yourself! So that’s it – that’s 2016 in a nutshell. Can’t wait to see what 2017 has in store. As always, if you have any general or specific questions about running a handmade business, selling on Etsy, doing craft shows, etc., please drop me a line. I’m always willing to help fellow entrepreneurs in any way I can (as long as you pay it forward when someone asks you for help in the future!). What a weekend. The 7th annual Indie Craft Parade took place this past weekend, and it was, as always, one of the best weekends of the whole year. This festival of all things handmade takes place every September, and it’s extremely competitive to get a spot as a vendor, but it’s a total blast once you’re in. It’s also a LOT of hard work. I spend every minute of the summer preparing for this show, and when the weekend is over and the dust has settled, it feels like I’ve just accomplished something big, something that’s been months in the making. Today, as I write this, everything is sore: my face (from smiling non-stop for 3 days), my feet (from standing for the better part of 18 hours), my back (from load in load out), and my brain (from keeping track of sales and trying my best to remember names), but I’m beaming with joy. I met so many wonderful customers and fellow artists, and I got to share my work with 7,000 people. There’s something really thrilling about that! This year was another record breaker, and I’m so thankful for everyone who came by my booth. I absolutely love to see people coming over to shop who are wearing jewelry they purchased from me years ago. I did lots of shopping as well, and these are my 2016 purchases. As in years past, I’m sharing some show stats, mostly because this event is fun to track from year to year. I sold less items than I did last year, but I earned more, and I also noticed I didn’t do as well on Sunday as I usually do, but I did almost double my usual sales during the Friday night VIP gala. You just never know how things will shake out! In addition to stats, I thought I’d share a few practical tips and tricks that have worked well for me over the years. These things might be useful to anyone considering doing a craft show, or even the craft show veterans out there. If you’re going to sit down at any point during the show, bring a director’s chair or taller stool so you’re still able to chat with customers and handle transactions without being hidden behind your display. It will feel more natural to talk to customers when you’re eye level with them, even if you’re going to sit. I know some pros say you should never sit (or eat, or be on your phone, etc.) but let’s get real here - you will probably need to do all three at some point! If you know you’re going to be standing for the majority of the show (either because you’re in the “never sit down camp” or because it’s going to be a busy show and sitting isn't an option) bring one of those comfort mats to stand on. Half the time I’m standing barefoot on one of those things and it really helps keep my legs from tiring out over the course of the show (and nobody can see it anyway!). You can never have too many business cards, bags, or dollar bills on hand at a show. 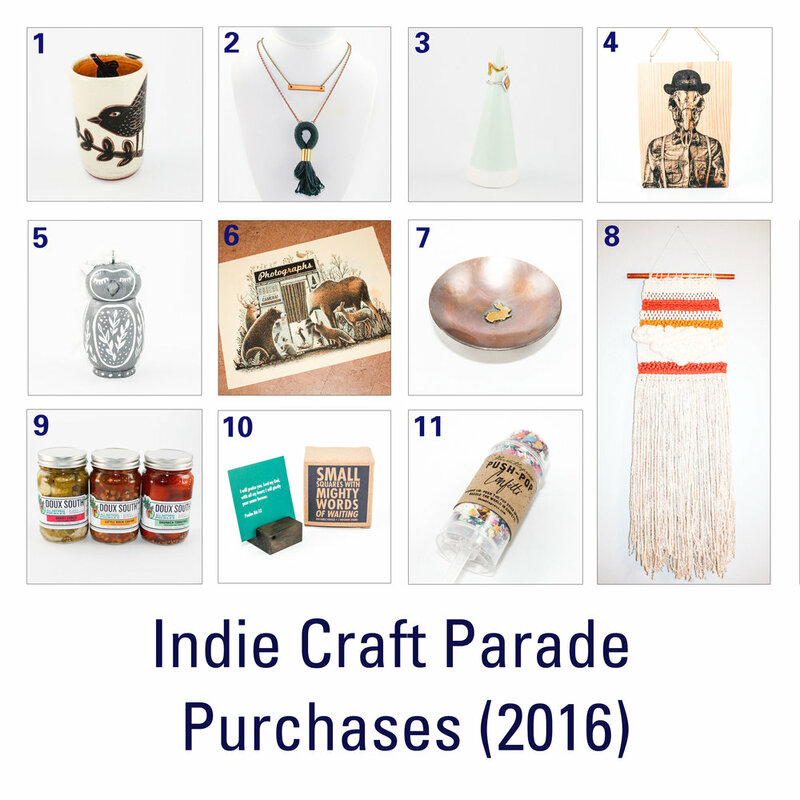 Every stinkin year, I think I have more than enough for Indie Craft Parade, and I’m wrong. This year I packed over 400 bags, nearly double what I packed the year before, and darn it, I still ran out. I also took 100 bucks worth of one dollar bills and ran out by the end of the day Saturday. Be prepared, or better yet, be beyond prepared! I have never run out of business cards as of yet (thankfully) but I have seen plenty of vendors who did, and I just hate to see them losing potential follow-up business because their customers have no way of finding them after the show. Pack lots of food and water. If a show is really busy, you may not be able to leave your booth for a meal, and only a handful of shows offer lunch deliveries. Also - when you’re thinking through what food to pack, I find it a lot easier to eat things with a fork (no sandwiches or pizza, etc. ), so you can sneak in a quick bite here and there, then get back to your customers after minimal chewing without having to worry about leaving to wash your hands, food in teeth situations, or having to take a long break to eat something big & messy in one shot. Be prepared for 60 through 90 degree temperatures, because both are possible and you have no way of knowing which. I’ve done shows where the AC was so extreme my fingers went numb and I shivered the whole time, and I’ve also had shows where I was a sweaty mess when the AC wasn’t at it’s best, so dress & pack for both extremes, no matter what time of year it is. Rethink your packaging for busy shows (or prepare it ahead of time). Unless you sell really high end or fragile items, I’d say the simpler the better. I always feel really awkward when I’ve made a purchase and I have to stand there while the artist makes fancy ribbon curls. I know not everyone agrees on this, but I wanted to put it on this list as something to encourage you to think through ahead of time. Bring back up devices for accepting credit card payments, extra battery backup, and all the chargers in the world. You don’t want any technology mishap to shut you down. Pay attention to the questions your customers ask (or keep a list, if that helps), because you’ll catch on to some repeat questions after a while which is a clue you may have something that needs to be addressed. 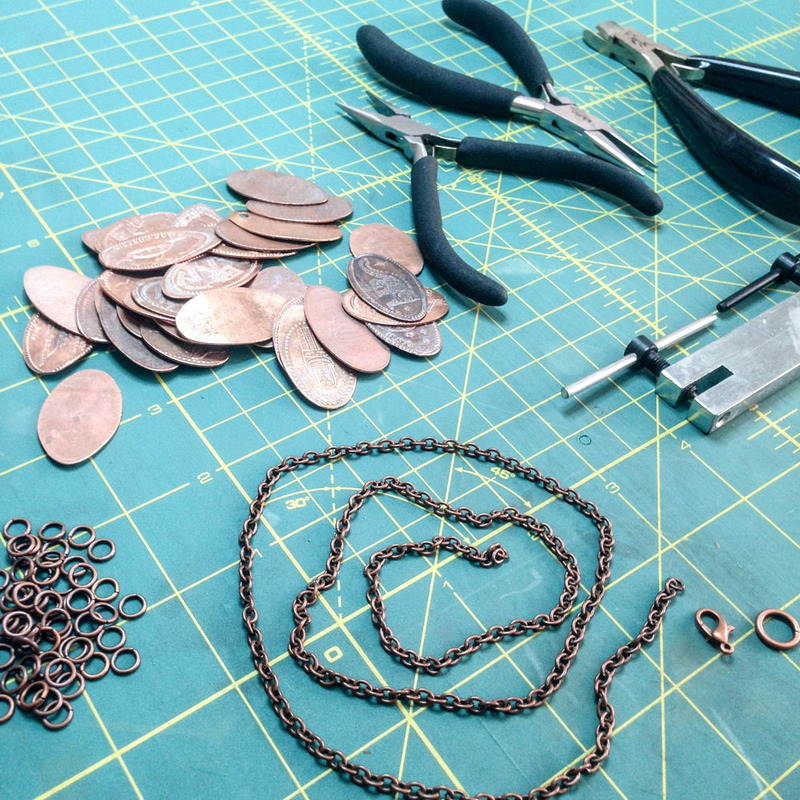 For example, when I first started selling my Curious Cameo pendants, people were always asking if I had longer chains. I never even thought of that until people kept asking about them, so now I keep extra chains if people would like to upgrade to a longer one. Easy solution! Consider taking custom orders during the show. For the longest time, people would ask for a custom item and I’d give them a business card and send them to my Etsy shop, and never hear from them again. Now, I offer to take their order right then and there, and I’ll even apply any show specials I have going on, so that I’m not leaving this possible future order up to chance. I also make things easy by bringing a color chart to the show so customers can see all the available options and choose exactly what they want.